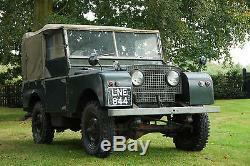 1950 Land Rover Series One 80 Regular. Please see our website for extra photos. Fitted with later, Series II type 3 main-bearing 2.25 petrol engine, coupled to what is believed to be original transmission and axles. 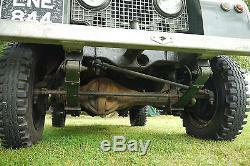 Narrow type rear leaf springs. Parabolic replacements fitted on front. Correct Series 1 type steel wheels with 6.00 x 16 Avon Traction Mileage tyres x 5. Runs and drives, but requires minor work to get to road worthy condition. The Land Rover was conceived in 1947 by Maurice Wilks, the Rover Companys chief engineer, who at the time used an aging World War Two Willys Jeep at his home in Anglesey. It was designed for use by farmers, light industry, and anyone else who needed a go anywhere, do anything vehicle. The first Land Rovers were launched in 1948 at the Amsterdam Motor Show, with an 80 wheelbase, a very strong steel box-section. And an aluminium-alloy (Birmabright) body. 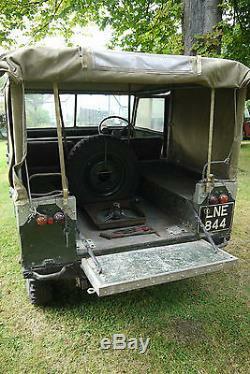 They were only offered with a few minor options to begin with, including the roof (canvas) as an optional extra! However, Land Rovers were very quickly adapted to perform a multitude of tasks, and began to outsell Rovers standard cars and the rest they say, is history! 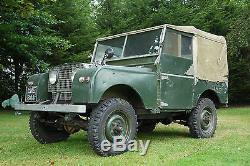 This particular Land Rover is a 1950 80 model; the 3. Year of production where a few small improvements were made including the yellow knob selectable 4wd, and the 7 headlamps-through-grille front end. Lenny (as it has been affectionately named by us due to the number plate) has had seven previous keepers since it was registered on 4. December 1950, and has had a few changes through his 66 year life. For the past 10 years, it has lived on a West Yorkshire farm and was in occasional use until 2 years ago, and has been dry stored in a hay barn since then. It is believed it has been used as a RTV trials competition vehicle; it has the remnants of a roll over cage mounting system attached to the chassis plus the holes in the rear floor, plus a very handy stout recovery bollard welded to in between the front dumb irons all part of its active history. 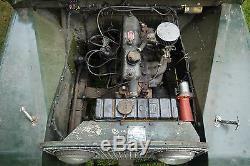 The engine has been changed to a later, Series II-on type, three main bearing petrol engine, and the battery has been relocated to under the seat again all pointing to a competitive past. The vehicle IS a runner, and could be put back on the road with a bit of work. Since a new battery has been fitted, the engine starts first time and runs, but is a bit smoky and burns a bit of oil. The brakes work okay however the pedal requires a couple of pumps to be fully effective, possibly requiring just a fluid change and bleed, or potentially the master cylinder replacing. The gears all select fine along with low range and 4wd, however we havent had chance to test it out to any speed since it is not currently roadworthy. The handbrake lever itself has been swapped to a later Series IIA type for ease of use. The electrics all work including the single Lucas wiper motor, the brake lights do not seem to operate but this could be due to the lack of aforementioned brake pressure since the switch is a hydraulic type. The original 80 dash binnacle is there, however there are auxiliary replacement switches for the lights and indicators plus the push button start has been moved to the binnacle. 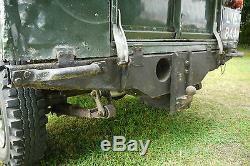 Underneath, the chassis is believed to be original and is solid; but there is the one or two repair patches (welded to good a standard), likewise the bulkhead. The body work is remarkably straight and tidy; the rear quarter panels have some light creasing in the bottom corners. There is a few areas in the cab which have been plated over with aluminium, and as mentioned before the rear floor has holes from where a roll cage has been mounted. 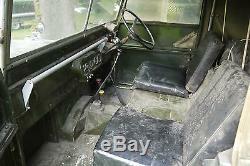 The seats are not the correct type and are tatty, but useable. The canvas hood is very good with no holes. 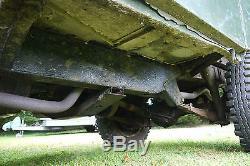 The exhaust system doesnt appear to be that old, possibly a later system to match the 2.25 engine. The axles appear to be original, and are sprung on correct, narrow-type leaf springs at the rear, and parabolic springs on the front. 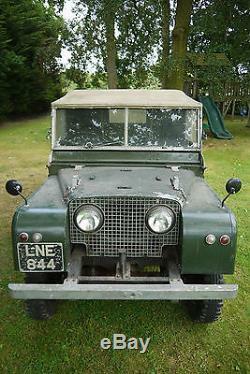 We have left it in its barn find state to let you decide plus it has a very authentic charm to it like that! 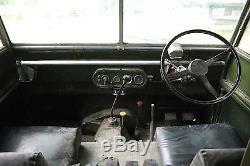 It comes with its original steering wheel, handbrake lever and radiator fan cowl. There is no MoT (it is exempt anyway however it is recommended you obtain one once it has been made roadworthy), and we cannot confirm what the genuine mileage is. This little Landy would make a fantastic investment, since early Land Rover values are still climbing to heady heights, and offers an authentic experience only the original Land Rover can! We have described the vehicle as accurately as we can, but please take your time looking through the photos. All funds must be cleared before the vehicle can be taken away. The vehicle must be collected our premises on the outskirts of Chester. Visit our website for more information and vehicles for sale, or call 07876 537421. 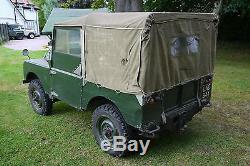 The item "1950 Land Rover Series 1 80 Eighty Inch Barn Find Restoration Project" is in sale since Saturday, August 20, 2016. 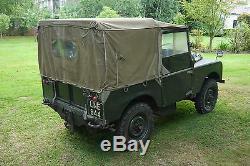 This item is in the category "Cars, Motorcycles & Vehicles\Classic Cars\Land Rover". The seller is "h1amc" and is located in Chester. This item can't be shipped, the buyer must pick up the item.